The Salesforce Cloud Driver enables applications to connect to Salesforce data via Web services. 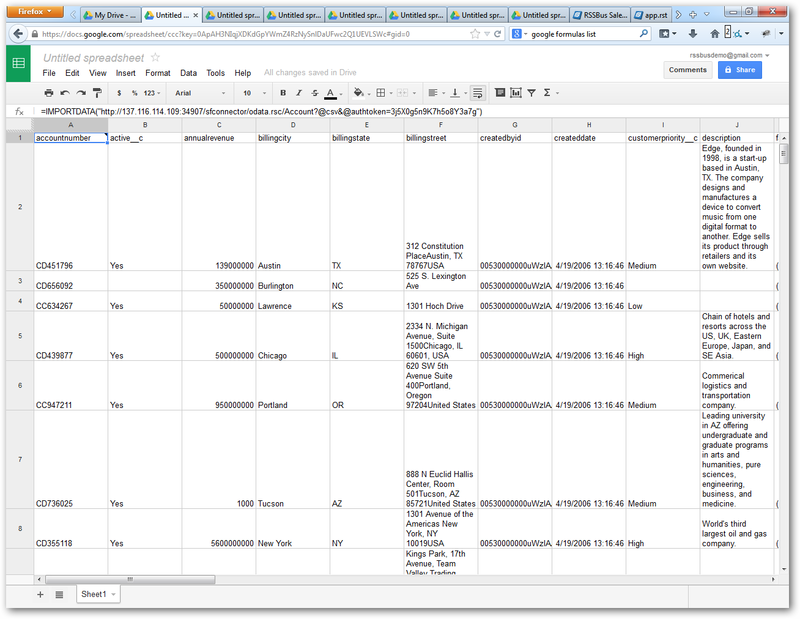 In Google Spreadsheets, you can consume Web services in the CSV format by calling the ImportData function. You can follow the three steps below to use the ImportData function to consume Salesforce data in Google Spreadsheets. If you have not already connected successfully in the cloud driver administration console, see the "Getting Started" chapter in the help documentation for a guide. Authenticate your query with the authtoken of a user authorized to access the OData endpoint of the cloud driver. Append the authtoken to the URL. OData queries, such filters, order-bys, etc. can be specified in the URL. See the APIs page in the cloud driver administration console for some example queries. woho! This is absolutely great help for me. Thank you for sharing excellent insight!